The Shangri-La Ironworks is a new line of resin 1/1200 scale naval miniatures. In the months to come, you will find a selection of unique and for the most part overlooked vessels from the 1914-1945 era. Kits are cast in white resin with main turrets, cranes and some superstructure parts cast separately. The Project 770 has 16 parts total while the subs are single piece castings. For the first time in five years, the Shangri-La Ironworks division is launching a new "Never Was" capital ship model. The USS Minnesota is a Fast BB proposed in 1934 with 9-14" rifles in three triple turrets and 12-5" guns in twin turrets. 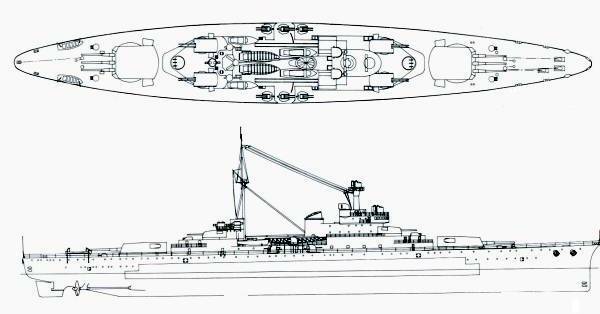 She was designed for 30kts at 35000 tons with excellent protection comparable to the later fast BBs (13" belt, 4.5"-5" on the decks). A sketch can be found in Norman Friedman's book "US Battleships : An Illustrated Design History" on page 234. The model includes 1.1" and 20mm guns for a model circa 1942.